RAMALLAH (Ma’an) — Scores of demonstrators suffered from excessive tear gas inhalation after Israeli forces dispersed weekly protests in the occupied West Bank with rubber-coated steel bullets, tear gas, and skunk water. 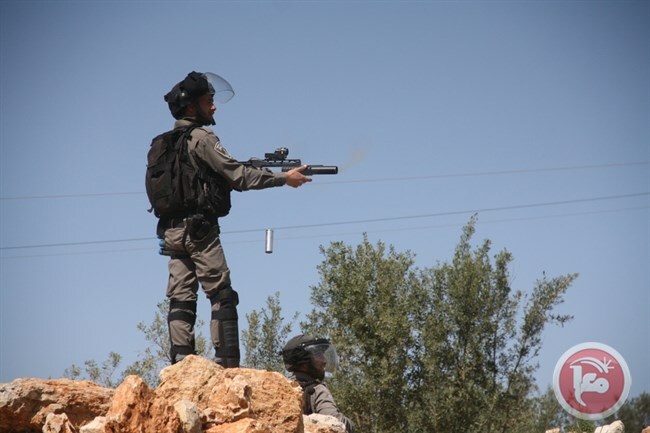 In the village of Bilin near Ramallah, Israeli forces reached the outskirts of the village from the southwestern side and fired tear gas and rubber-coated bullets at Palestinian, Israeli and foreign activists who had gathered for the occasion. Participants commemorated the 38th anniversary of the death of Dalal al-Mughrabi, a Palestinian activist and resistance fighter who was killed while carrying out a bus hijacking in which 38 Israelis, including 13 children, were killed. They also observed the 13th anniversary of the death of American activist Rachel Corrie, who was run over and killed by an Israeli army bulldozer while trying to prevent home demolitions in the Gaza Strip. In the village of Kafr Qaddum in the northern West Bank, dozens suffered from tear gas inhalation as Israeli forces dispersed the weekly protest calling for the reopening of the village’s main road, which has been closed for 13 years. The spokesman for the Popular Resistance in Qalqiliya, Murad Shtewei, said the Israeli army raided the village firing stun grenades and rubber-coated steel bullets. Shtewei added that they also sprayed skunk water, covering the home of at least one village resident in the foul-smelling liquid. Many villages in the occupied West Bank and Jerusalem participate in weekly Friday protests, including Kafr Qaddum, Bilin, Nabi Saleh, Nillin, and al-Masara.